Admire the natural beauty of “America’s Favorite Town” in this full-color Beaufort, North Carolina wall calendar. 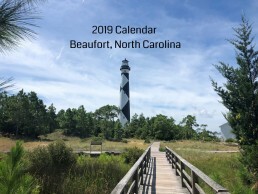 Filled with an abundance of holidays, the 2019 Calendar also includes the key events happening in Beaufort throughout the year. The wall calendar makes displaying easy. The size is an 8 1/2″ x 11″ format. It’s the perfect gift for anyone that loves Beaufort! Diamond Lady turns 160 years old! On November 1, 1859, the lighthouse Cape Lookout National Seashore was lit for the very first time. After 160 years of hurricanes and nor’easters, changing from whale oil to a solar-powered beacon, and even surviving a bombing during the Civil War, the lighthouse welcomes visitors with its distinctive checkered pattern and beacon. Betsy Cartier started capturing images of sunsets and sunrises as a hobby for over 10 years. That interest continued upon coming to Beaufort. 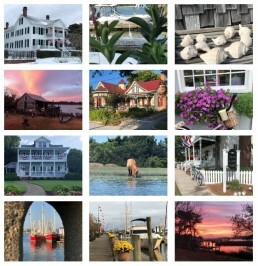 Combining her love for history and the water, Betsy has assembled some of her favorite photos of “America’s Favorite Town” into a 2018 Beaufort Calendar. 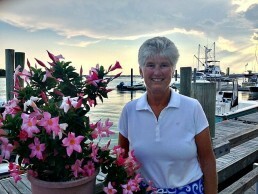 As the co-owner of Hungry Town Tours, Betsy takes visitors, locals, and boaters alike, to see Beaufort’s old-world, southern charm, steeped in North Carolina maritime history like never before. Hungry Town Tours offers several award-winning guided walking and bicycle tours through 300 years of Beaufort’s history. Hungry Town Tours gift certificates. Click here to learn more our gift certificates.